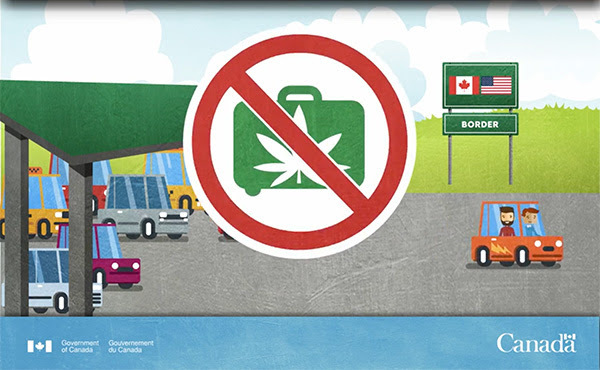 It is legal to travel within Canada with up to 30 grams of dried, legally purchased cannabis, but it is illegal to enter or exit Canada with cannabis in your possession. I Just Bought Cannabis in Manitoba. How Do I Get It Home? Laws for transporting cannabis in a motor vehicle in Manitoba are similar to those in place for transporting alcohol. You cannot drive a vehicle while consuming cannabis and cannabis cannot be used by any of the passengers while the vehicle is operating. Cannabis should be stored in the trunk of your vehicle when travelling in Manitoba. You can also carry up to 30 grams of legally purchased cannabis on public transportation, but whether driving or riding, you should keep your cannabis in its original packaging and always carry the proof of purchase. Travelling within Canada with Your Cannabis. Know the Rules! Although it is legal to travel within Canada with 30 grams of legally purchased cannabis, there are a number of rules and regulations you must follow that differ slightly from province to province, including varying age limits for purchase and consumption. The legal age for cannabis consumption and possession is 19 in all provinces except for Alberta and Quebec, where it is 18. If you are travelling from Alberta or Quebec and you are 18, you cannot legally take your cannabis with you to (or through) any of the other provinces other than Alberta or Quebec. You can carry your legal cannabis with you while travelling on public transportation such as buses, trains and planes while within Canada, but not when entering or leaving Canada. You can carry your legal cannabis with you while travelling on public transportation such as buses, trains and planes while within Canada, but as previously stated, you cannot take your cannabis with you when entering or leaving Canada. When flying domestically (within Canada) you can store up to 30 grams of dried, legally-purchased cannabis on your person, in your carry-on or in your checked baggage. Medical cannabis consumers can carry more than 30 grams, but only if their medical documentation says they can. Cannabis oil is also allowed on domestic flights but is subject to the Canadian Air Transport Security Authority’s (CATSA) regulations, which limit you to no more than 100 ml of cannabis oil. The penalties for transporting more than your legal limit of cannabis, or for transporting illicit cannabis, apply no matter what form of transportation you are using. Keeping this in mind, it is probably a good idea to keep your cannabis in its original packaging wherever you are travelling. Each province has its own unique excise stamp for legal cannabis products, which make it easily identifiable if required. At the very least, you should carry a receipt for the cannabis you are transporting, whether travelling by bus, train, plane, or driving, especially from province to province. Additionally, it is your responsibility to know the different cannabis regulations for each province you are travelling in. To ensure you’re up to date with the most current regulations, please review the informational links found at Cannabis in the provinces and territories, before you travel. International Travel with Cannabis. Don’t Do It. It is illegal to transport cannabis in or out of Canada. This applies regardless of whether you are authorized to use cannabis for medical purposes or not. It also applies regardless of whether you are travelling to or from a country that has legalized cannabis. Also of note, even if you are travelling from Canada to a U.S state that has legalized the possession and use of cannabis, it is still illegal in Canada to transport cannabis across the Canadian border. Additionally, cannabis remains illegal under U.S federal law, which can lead to prosecution, fines and jail time in the United States. And if you do arrive in Canada with cannabis in any form, you must declare it to the Canada Border Services Agency (CBSA). Failure to do so is a serious criminal offence. Bottom line? Don’t travel internationally with cannabis.